Preparatory pre-professional ballet technique and advanced-beginner pointe work. Open to continuing Ballet 2X students and new students through class audition. 3-4 full years of classical ballet training (not including Pre-Ballet levels) required. Workshops and summer intensive are strongly recommended. 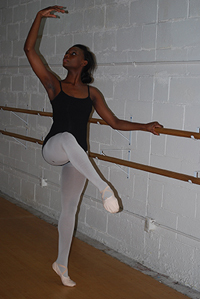 Preparatory pre-professional ballet technique and Intermediate pointe work. Open to continuing Ballet 3 students and new students through class audition. 3-6 full years of classical ballet training (not including Pre-Ballet levels) required. Workshops and summer intensive are strongly recommended. Mature dancers may explore student teaching at this level.